Being the mother of teenagers can be a real roller-coaster ride. I’m sure any mother with teens would agree. You go from being a mom who is adored and loved by that sweet little baby to being the “wicked witch of the west” from the perspective of the teenager. Now, maybe that’s not exactly true, and I’m exaggerating a bit, but sometimes it sure does feel this way. About a month ago, I went through a period where nearly everything that came out of my mouth was fair-game for my older son to look upon as silly, nonsensical, pathetic, “retarded”, stupid …you get the picture! For a while, I tried to ignore what he was saying, chalking it up to the fact that he was a teenager, trying to be more autonomous, going through individuation and separation from a Leo mom who looks upon her kids as her most valued and beloved cubs. In general, although I’m quite authoritarian about things like school and politeness, I tend to be pretty flexible and not quite as much of a disciplinarian as perhaps I should be at times. A week later, my younger son decided to join his brother’s bandwagon and next thing I knew, they had ganged up on me. Now, they were both deprecating me in their wonderful teenage style. Suddenly, I felt myself becoming vulnerable, tears welling in my eyes as a result of their negativity. Seeing the hurt on my face and knowing me well, my husband decided to intervene and give them a “this is no way to treat your mother” lecture for which I was thankful. Unfortunately, the hurt had already been done and there was just one way for me deal with it. 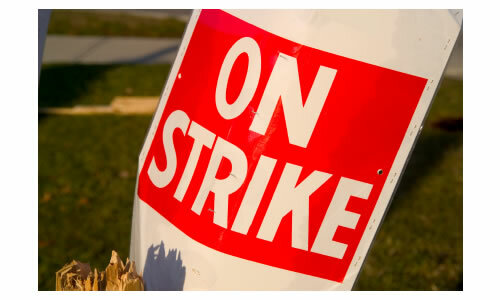 I went on STRIKE! I became unpleasant and distant. I couldn’t help it. I felt hurt and beaten. I stopped doing laundry, cooking, helping with homework, and all manner of other things that a mom usually does because that’s her “job”. In 2011, Jenna Goudreau of Forbes wrote an article entitled, “Why Stay-At-Home Moms Should Earn A $115,000 Salary,” and though I’m not a stay-at-home mom, I still think I deserve at least $100,000 for what I do around the house. Hell Yeah! So for about 4 days, I did absolutely nothing around the house, “Oh you’re hungry? Go get something to eat. Oh your clothes are dirty? I thought I taught you how to use the washing machine. Oh you need a ride to your friend’s house? Public transportation is a good option.” These were the kinds of responses that the 3 men in my house were getting and they didn’t like it at all. Luckily, my husband didn’t argue because he got the point. My kids felt bad and started asking when Mom would go off strike. I told them I would go off strike when their attitudes got better, when I felt less hurt, and when they recognized that what I give freely and willingly as a loving mother is actually worth a hell-of-a lot. After about 4 days, and the house looking like quite a bit of a wreck despite their good efforts, I decided to go off of my strike, but not before I told them that in the “real world” not only disgruntled employees eventually stand up for themselves to say “enough is enough”, it can also happen in your very own home!